0.1.73.18 released to fix a huge CPU hogging bug. Sorry. This release (a long time coming) is an almost complete refactor of the original WordTsar. Many speed increases, and it should be easier to add functionality. I’m starting to use this version for my daily work, but beware, monsters may lurk in the corners. For now, please use the forum to report bugs. I’m working on a public bug tracker. I’ve been using Alpha 0.0.51.2014-10-07 for the last few years on both Linux (very stable), and OSX (somewhat stable). I wrote three novels using that software (http://geraldbrandt.com) and got them published by one of the Big 5. It was software that worked, but had its flaws. For example, when starting a new document, you needed to insert a pages worth of blank lines, go back to the top of the document, and start typing. That kept it stable. Unfortunately, the software had also reached its limits. Adding new features would have been a major pain. So, I did what any developer would do… I refactored the darn thing. I’m seeing speed increases of 200% – 2000%, depending on what I’m doing. Fonts work a bit bettter. RTF import has a bug with font tables, but kinda works. Battery usage on laptops is great. Memory usage is a bit higher. I currently have version Alpha 0.1.73.0 running on Windows 10 and Ubuntu 17.10 and 18.04 (GTK2 and GTK3). I’ll be getting OSX running over the next couple of weeks. I believe 0.1.73.0 has feature parity with 0.0.51, but I’ll have to double check. I’m working on stability now — along with the OSX port. For a project that’s been basically dead for the last three years, this is a positive step. Keep watching, it’ll be up in binary format soon. Source code to follow (it may take awhile… I’d love to have a finished product before I release source. Who knows). The latest Alpha was released today. This release brings about background document formatting. Now, if you have a 50 page document, and you increase line spacing to 2 at the top of the document (.ls2), you’ll see the page count increase. Unfortunately, we still have a bug. 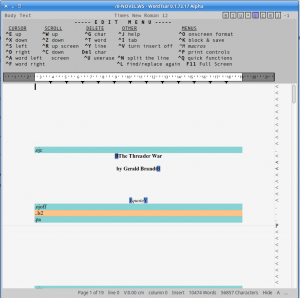 WordTsar doesn’t know when to stop formatting, so it always reformats to the end of the document on every keystroke. On desktops, it’s not a big deal, but on laptops, you will notice a battery drain. Version 0.50 Alpha is ready. I’m just doing final compiles and tests on various platforms. It’s been awhile since I put out a new release. I’ve been working on (slowly) getting some of the backend formatting multi-threaded, trying all sorts of tricks with font handling, freetype, etc, etc. Finally decided to Keep It Simple. Page formatting is now done ‘in the background’. It’s not perfect yet, and laptop users will notice a higher CPU usage/battery drain. I’ll release what I have next week, and work on the issues in the coming weeks. We are back from holiday, and itching to get back to the code. We have some emails and registrations to catch up on as well. Just a quick note. We are still on holiday. I’ve noticed several requests from new testers. We’ll get to them when we get back. The download site is having some issues, and downloads are not available right now. Work has slowed down… The kids are out of school, and the camping season has started. We’re up to 0.46 of WordTsar, thanks to our testers, and 0.47 will be out this Friday. There are a few known issues with 0.46 (check the forum), but all in all, we seem to be fairly stable. I’ll be spending the summer adding functionality, so if there’s anything you would like to see first, post in the forum. I have some new testers in the queue. If I haven’t responded to you yet, give me until sometime next week. 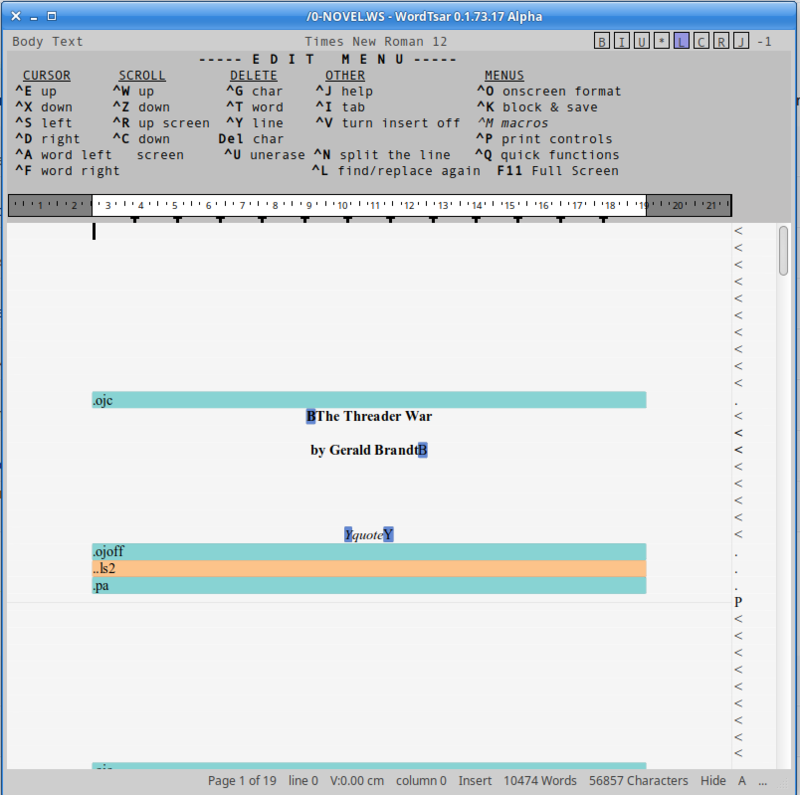 WordTsar 0.43 Alpha was released last week. A big thank you to all my testers! WordTsar | Powered by Mantra & WordPress.